Bonding and grounding wires, drum vents, coiled bonding wire, horizontal drum vents, vertical drum vents, EL fittings, grounding wires. Antistatic wires prevent sparks from static electricity generated by movement and flow of flammable liquids. Bonding between containers during liquid transfer, and connecting drums to an earth ground are required under Federal and Local Codes. User is responsible for all applicable ANSI & OSHA regulations that apply to the use of these items. Remove paint from safety cans where attaching the bonding or grounding wires. Standard wire lengths are 3' and 10'. For longer reach use several wires with .25" terminal ends. 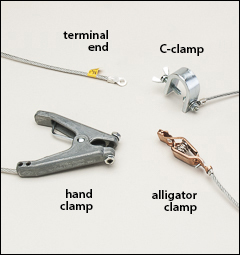 Individual clamps and custom length bonding and grounding assemblies are available. Bonding and grounding wire assemblies provide for an effective grounding to dissipate static electricity generated during the transfer of your flammable liquids. Complies with OSHA requirements for protection against static sparks. 36" flexible plated steel cables. Justrite coiled cable bonding wire provides an effective cost-efficient and easy to use system that keeps the cable off the floor. Corrosion resistant vinyl coated bonding cable in 10' length. Hand clamp is on one end, screw lug on other. Brass horizontal vent for petroleum based applications. Provides automatic pressure relief; operating valve opens at 5 psig internal pressure in normal service. Vacuum relief is manual on this horizontal vent. Includes a flame arrester for added safety. FM approved. For use with drums in the horizontal position. WARNING: Proposition 65 Label for drum vents . Brass vertical vents for petroleum based applications. Both vents must be installed in vertical position. Provides automatic pressure relief; operating valve opens at 5 psig internal pressure in normal service. Vacuum relief is also automatic on these two vertical vents. 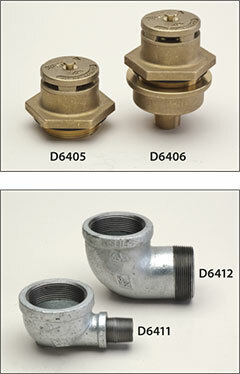 Both include a flame arrester for added safety. FM approved. For use with drums in the vertical position. WARNING: Proposition 65 Label for drum vents . 90° elbow fittings used for mounting D6405 vertical vent into a drum in the horizontal position. 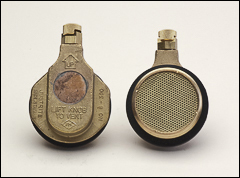 Allows D6405 vent to remain in a vertical position while being used on a drum in the horizontal position.